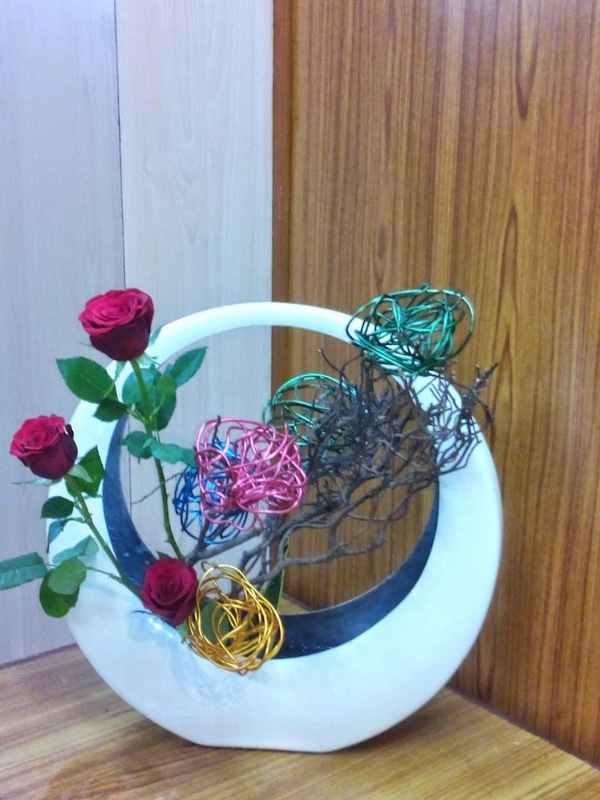 Click on the link below for the exhibition album. 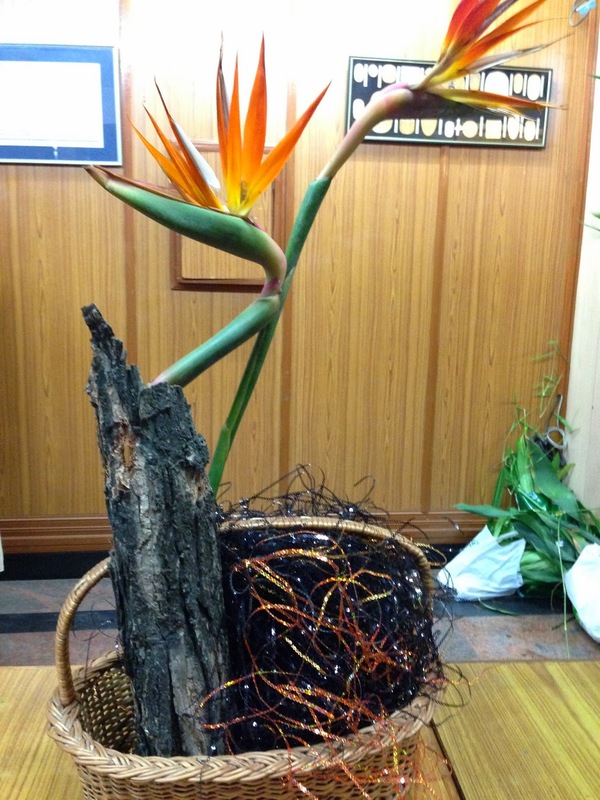 Click on the link above for a close peek at our annual exhibition. 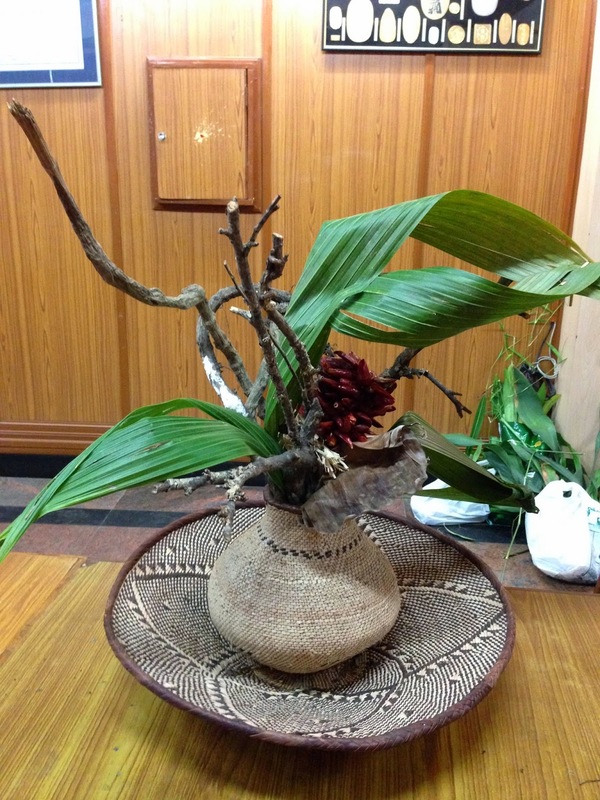 From cycle wheels to clothes clips, thermocol packs, to coconut shells, everything has an artistic value and helps our creative energies. 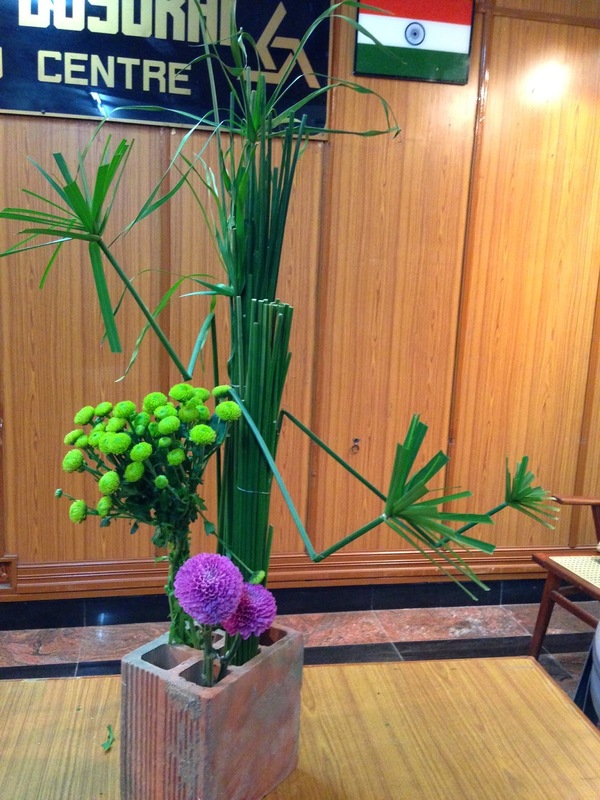 Chrysanthemums, lilies, crotons, orchids, bottle brush, palms, dressina and jerberas, are just some of the wide variety of material used. 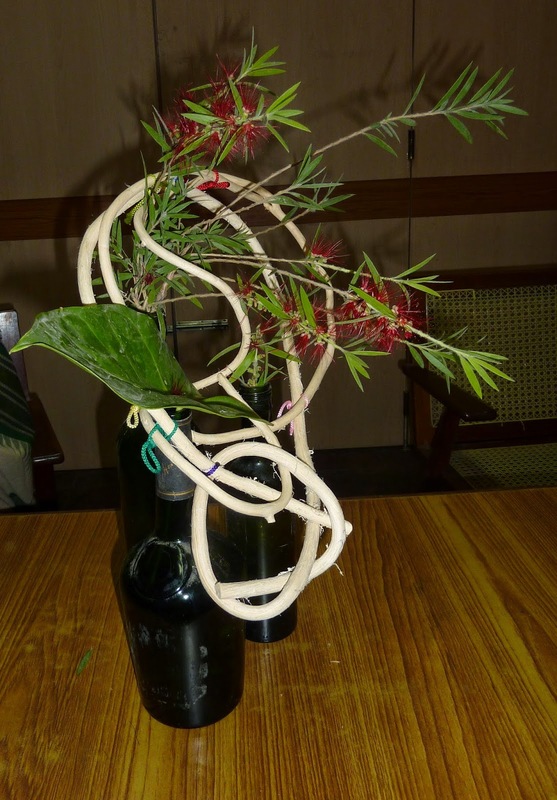 Pods and berries, roots and shoots, you will find them all. 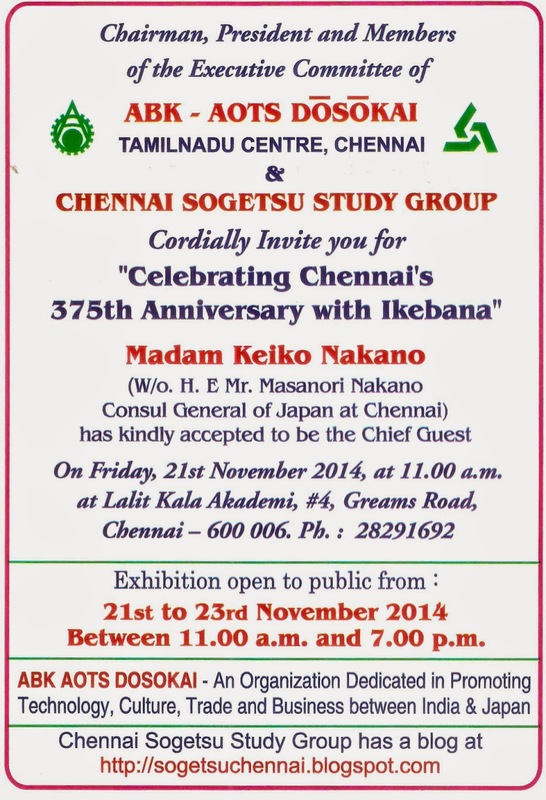 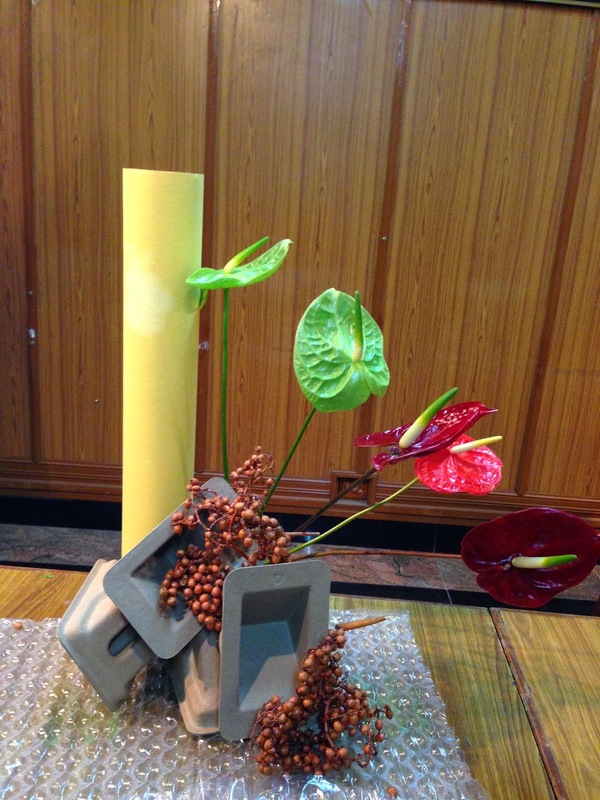 Each composition has a bit of Chennai in them, as we celebrate our city's 37th Anniversary, so come and take a look! 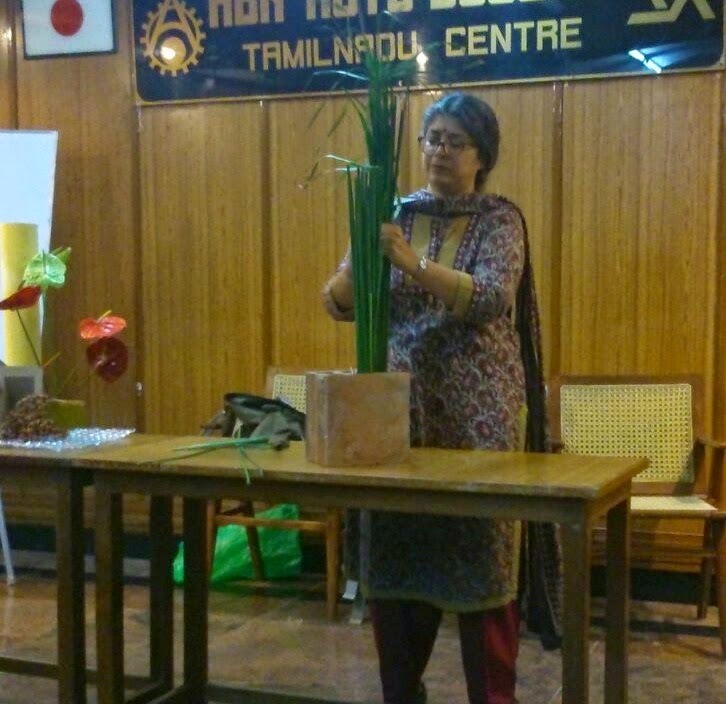 Our September workshop featured sensei Meenakshi Sarin demonstrating with combination vases, followed by a workshop where the members also worked with combination vases. 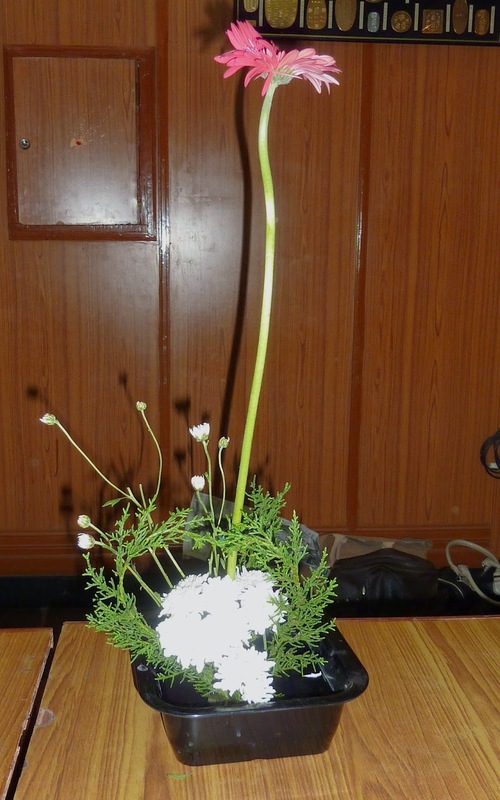 Both her arrangements were with nagiere vases, though completely different in texture and style. 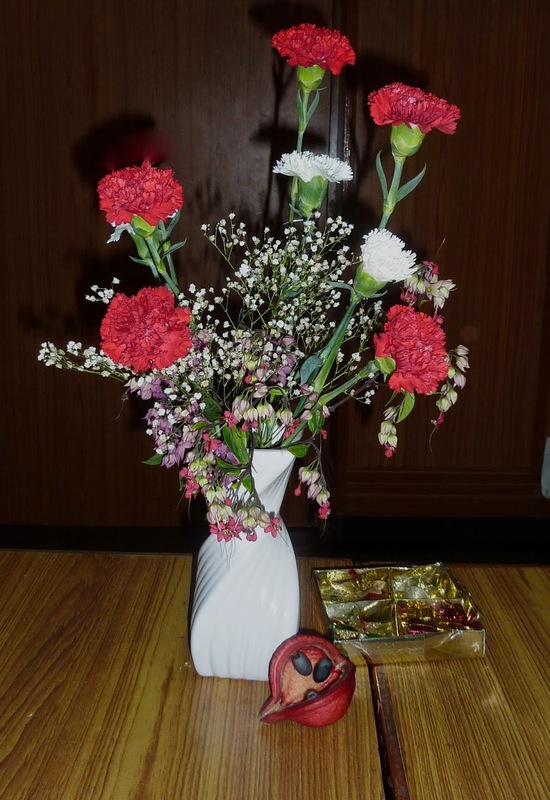 Her first arrangement was with a pair of glass vases. 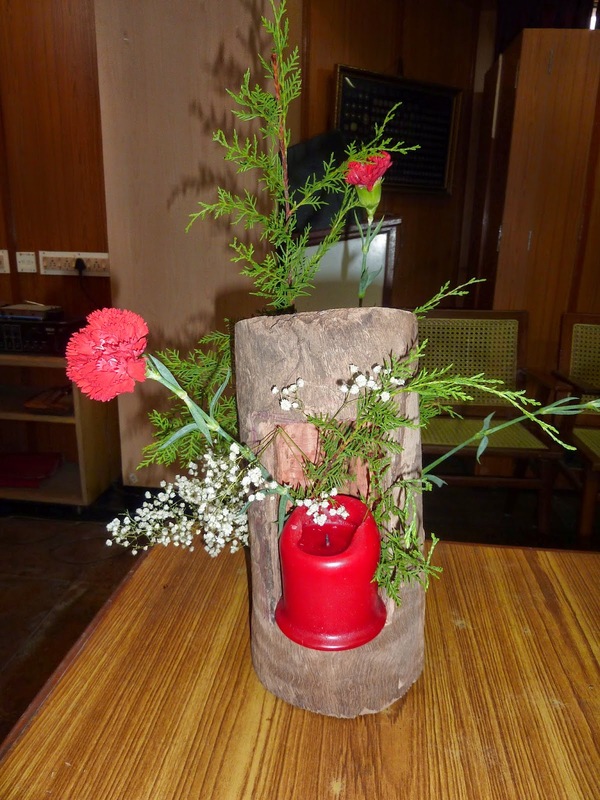 Meenu filled the vases with formica strips from the carpenter working in her home, creating an interesting effect. 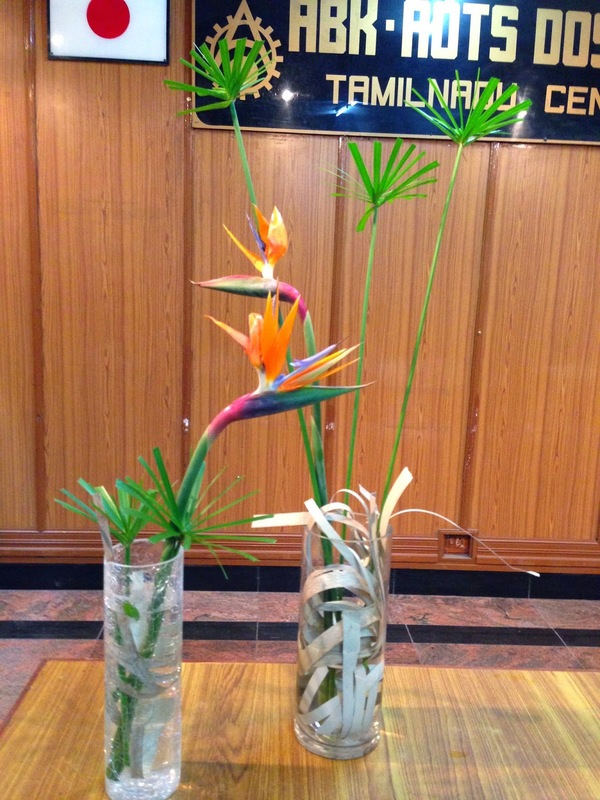 The strips also served as a fixture for the strelitzia and umbrella plant in the arrangement. 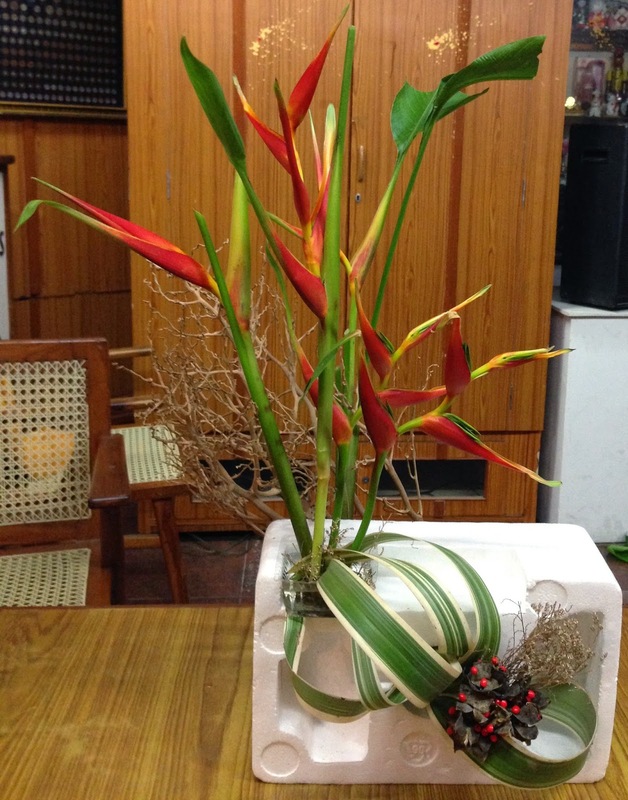 Her second arrangement was this beautiful pair, elegantly complemented with the heliconia. 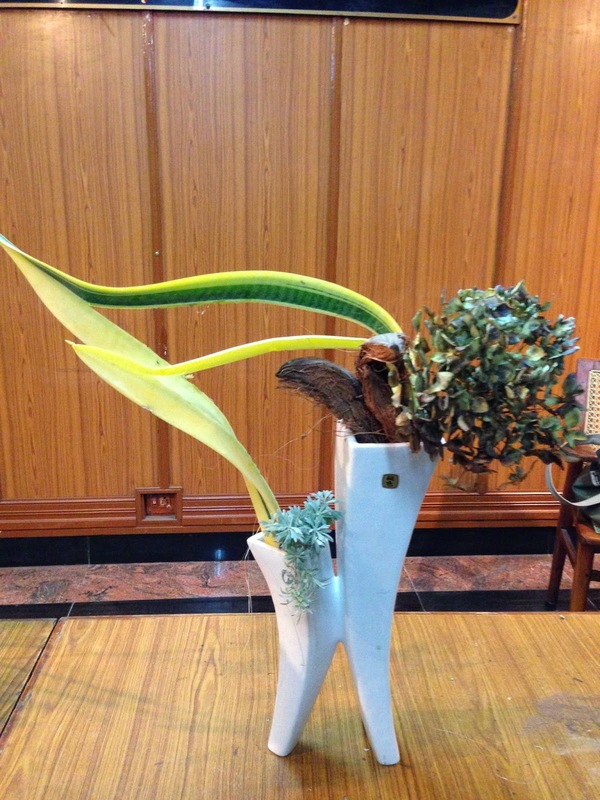 The graceful bamboo and the variegated dressina added depth to the creation. 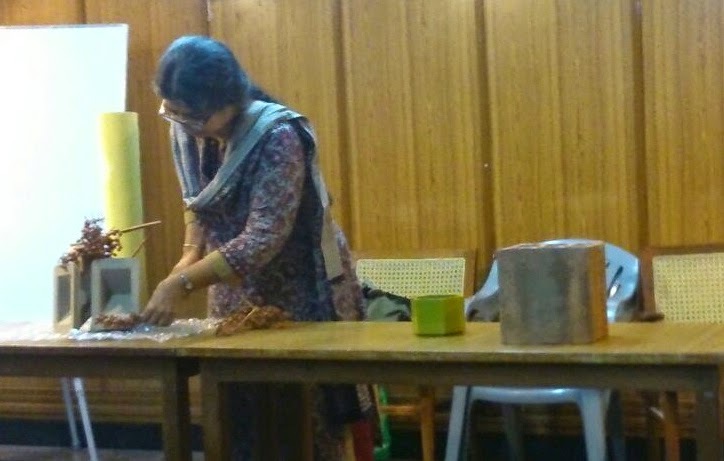 It was a wonderful start to the workshop, and then it was time for the members to try their hands, and everyone worked with enthusiasm. 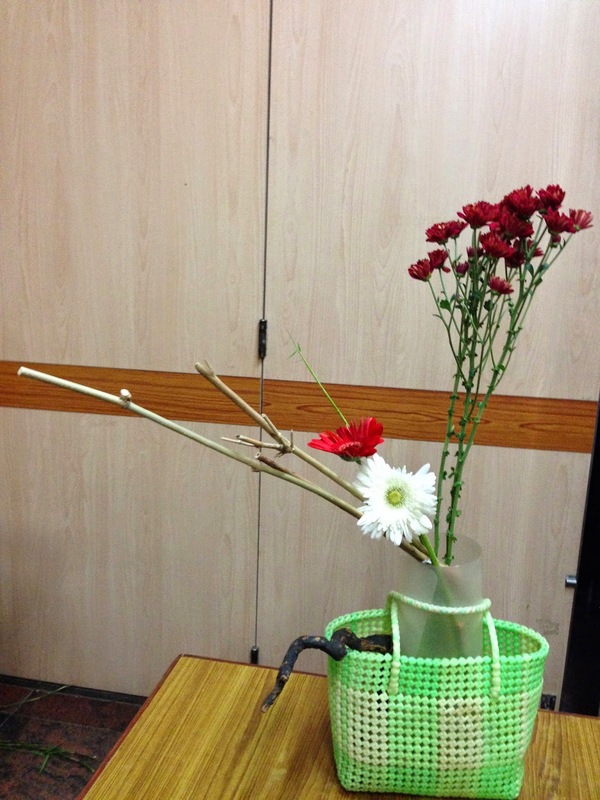 The vases were all different and there was a variety of material on display as well. 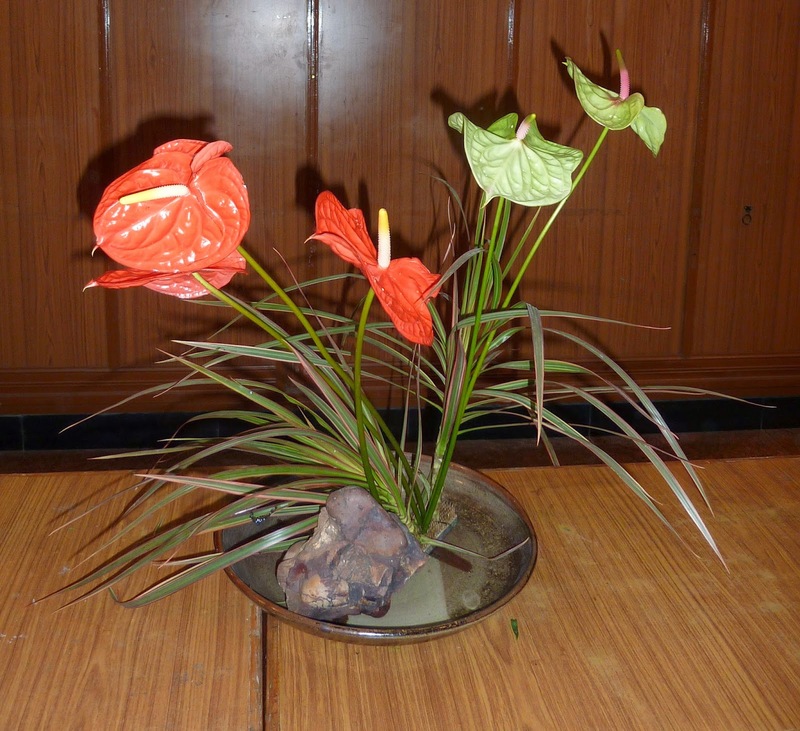 Ambika used a pair of nagiere glass vases, with one horizontal, to display the attractive mouth, shaped like the hosta lily leaves in the upper vase. 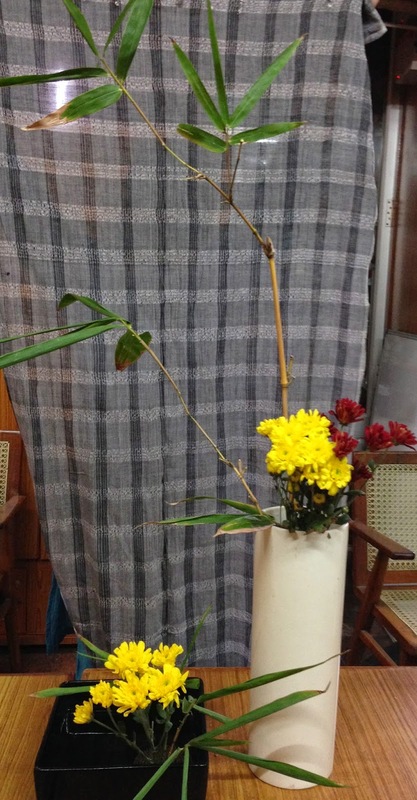 The jerberas and orchids added colour, depth and form to the composition. 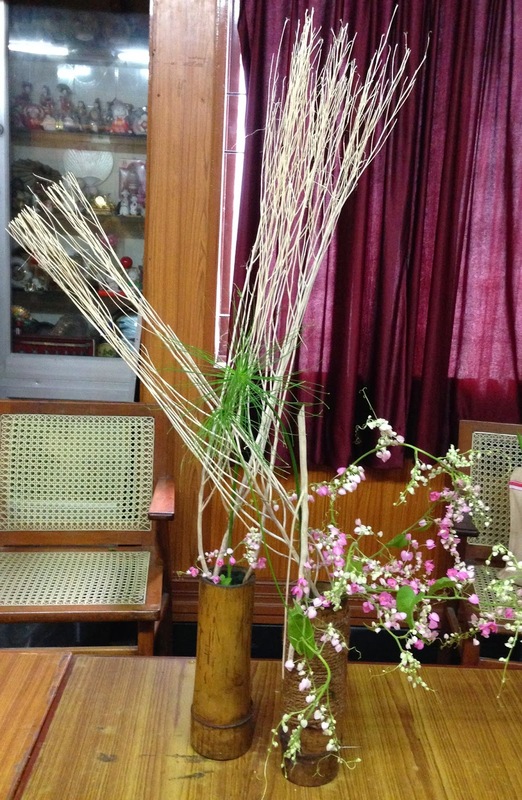 "I used two ornamental glass bottles, and the cicular cane was to highlight the wooden tray. 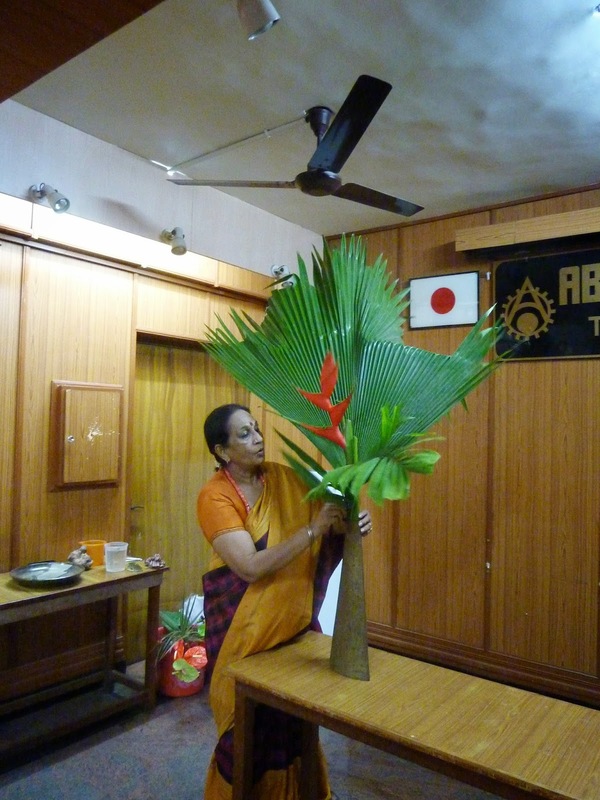 The greens are all local and the jerberas are the focal point", said Trishala. 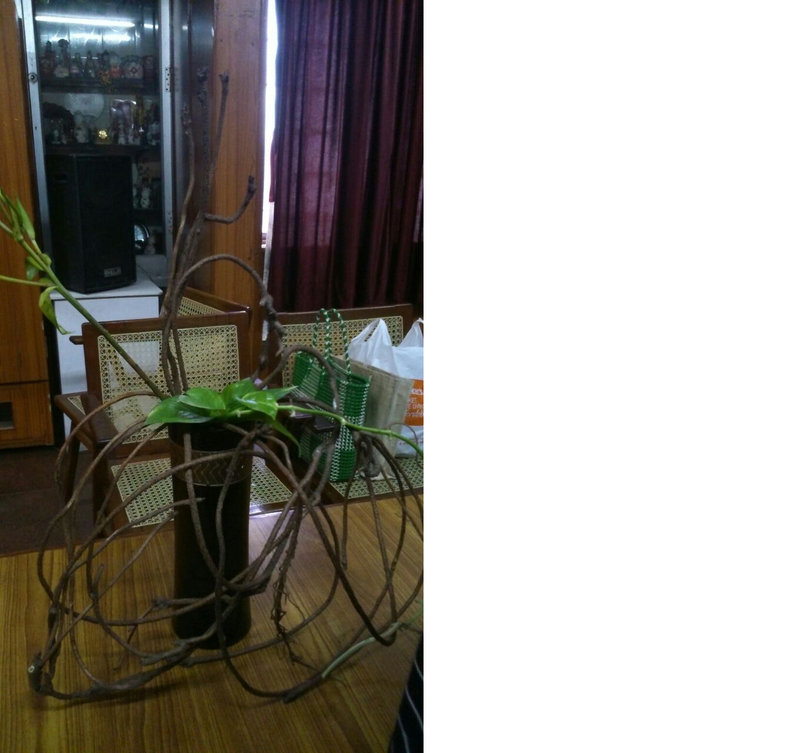 Prerana said, "I used a brass Auroville moribana vase in combination with a nagiere ceramic brown. 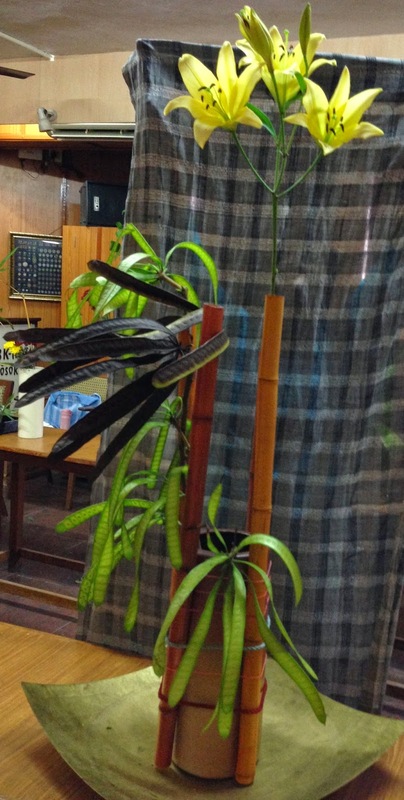 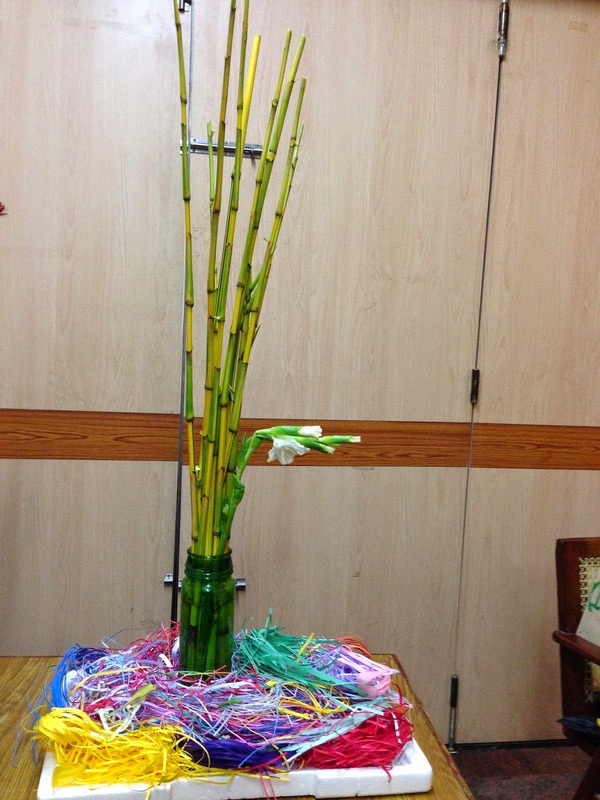 Bamboo sticks were used with Subabul pods - green and dry along with Asia Lily. 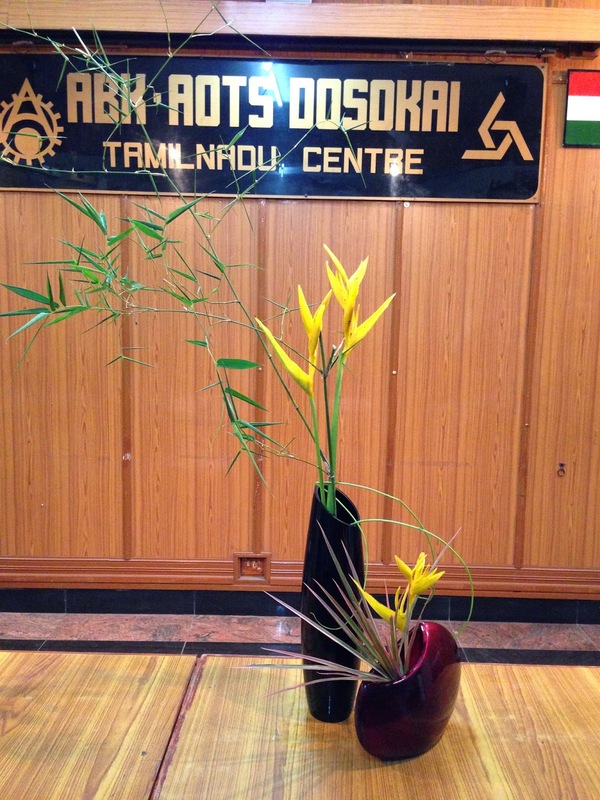 Malathi sensei felt it had a glamorous look to it!" 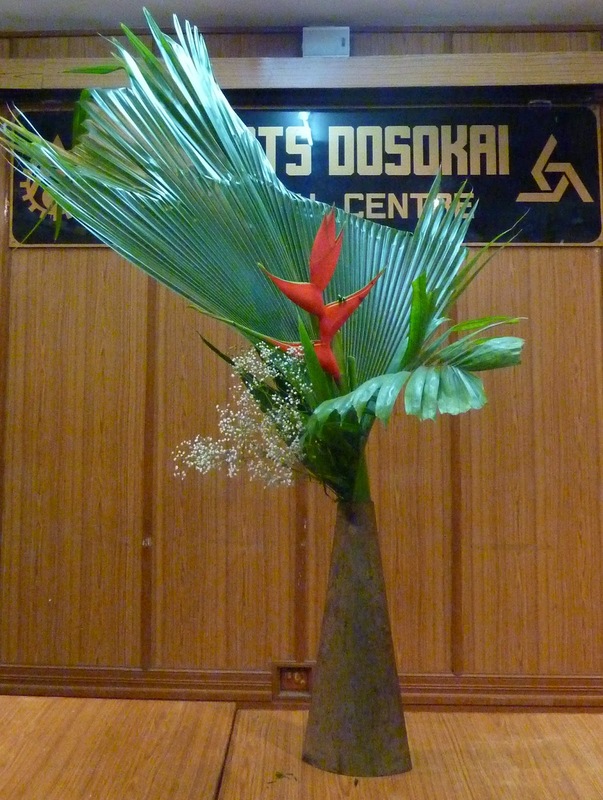 Itsuko Sakamoto created a neat arrangement with the Sogetsu triangle vases in combination. 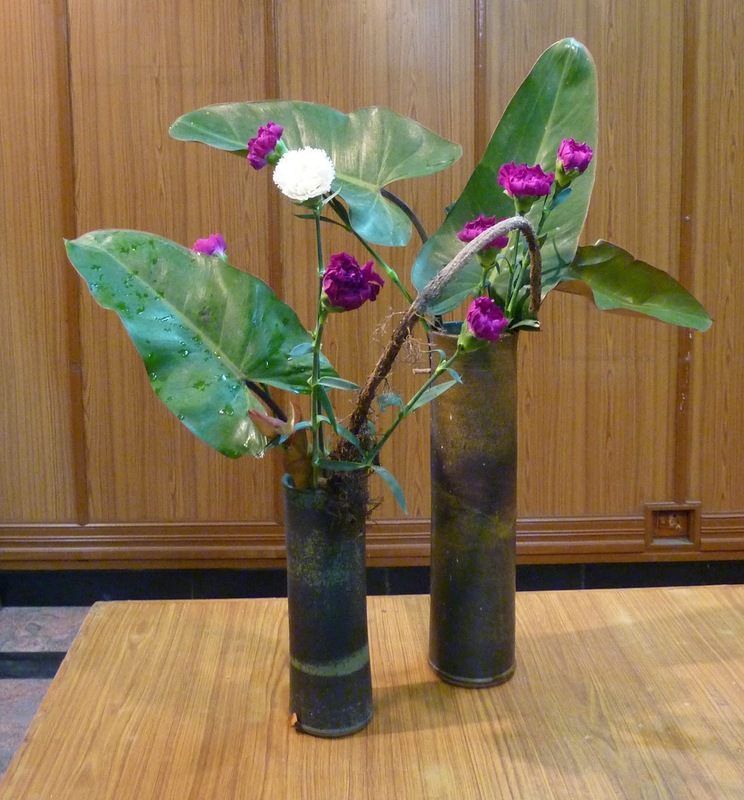 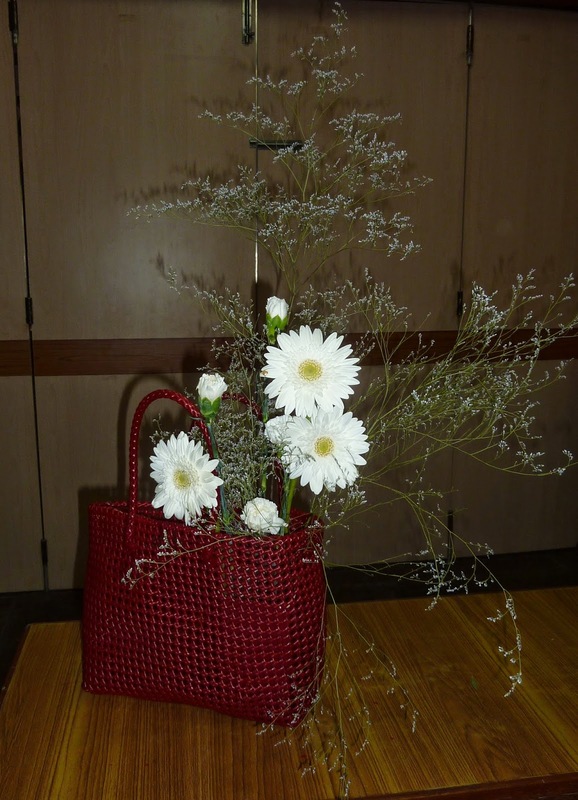 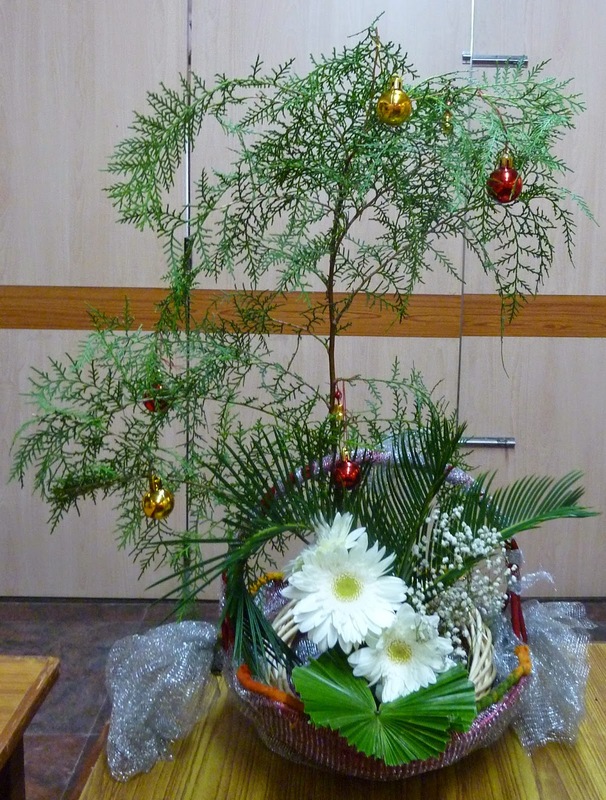 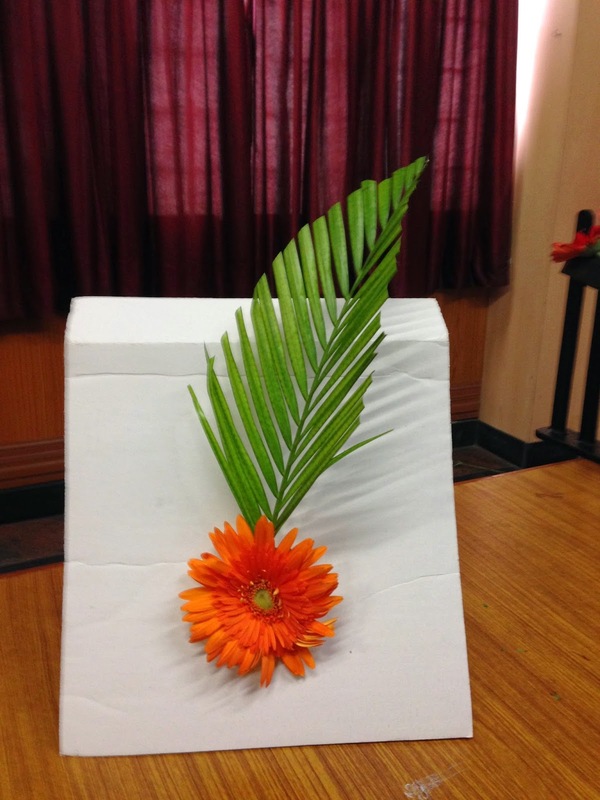 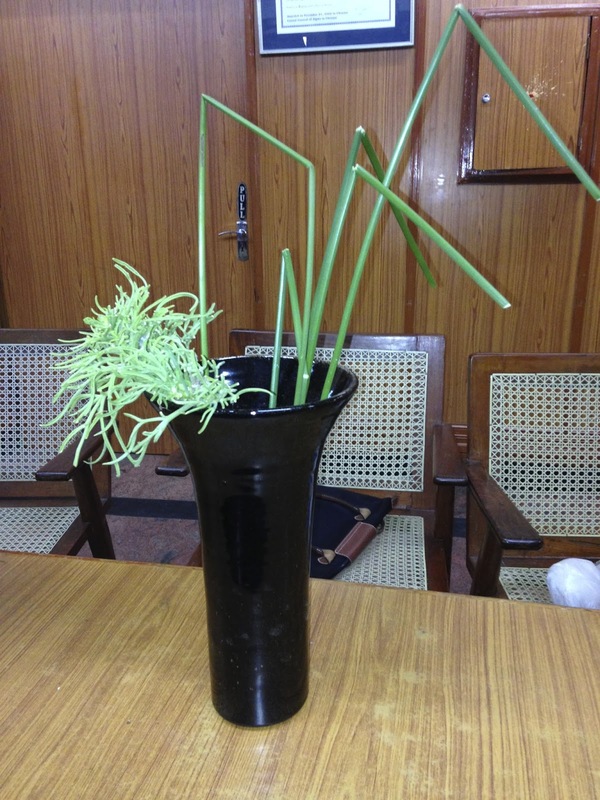 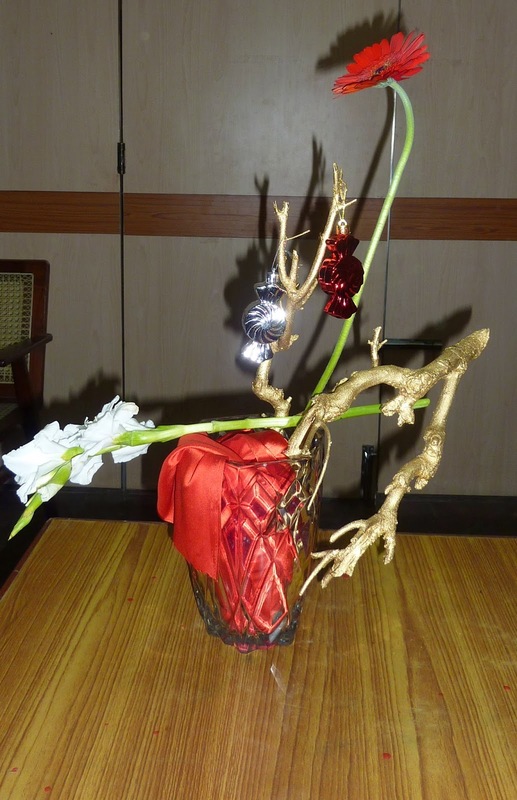 New students, Rupa and Chanchal created these two combination vase arrangements. 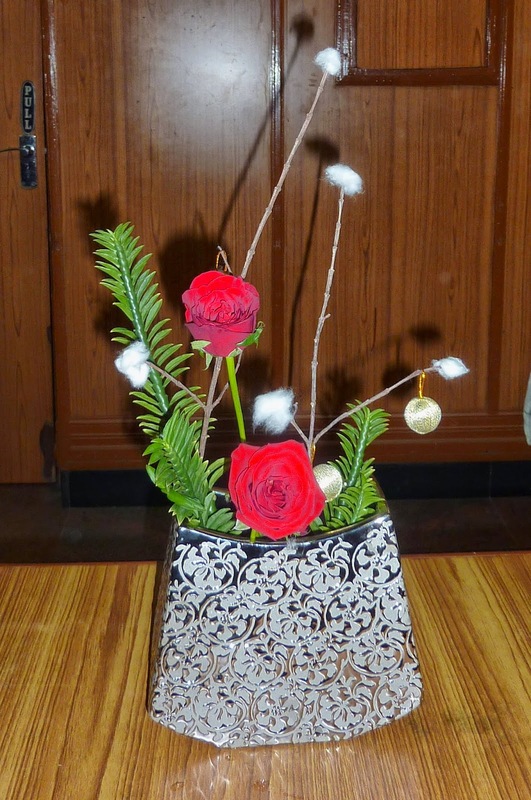 Nirmala created a dramatic effect with the two brass vases and strong bold lines. 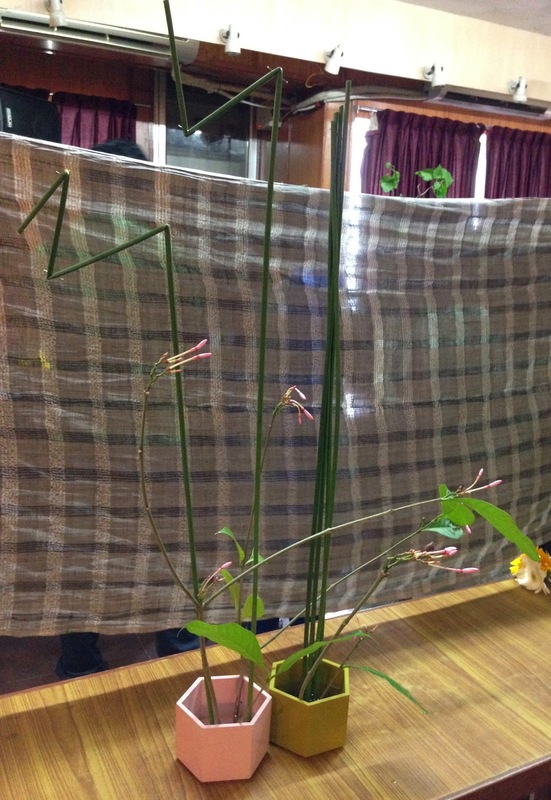 Sensei Molly also had bold mitsumata lines in her bamboo containers, softened by the delicate antigonon vine. 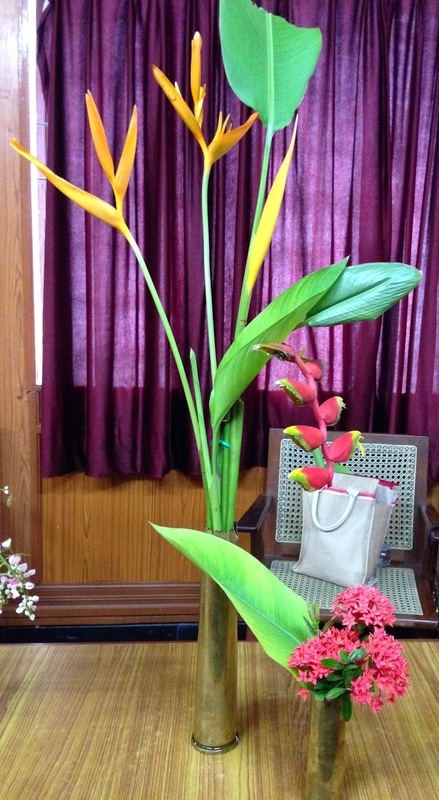 It was a colourful and exciting morning, and we all enjoyed it. 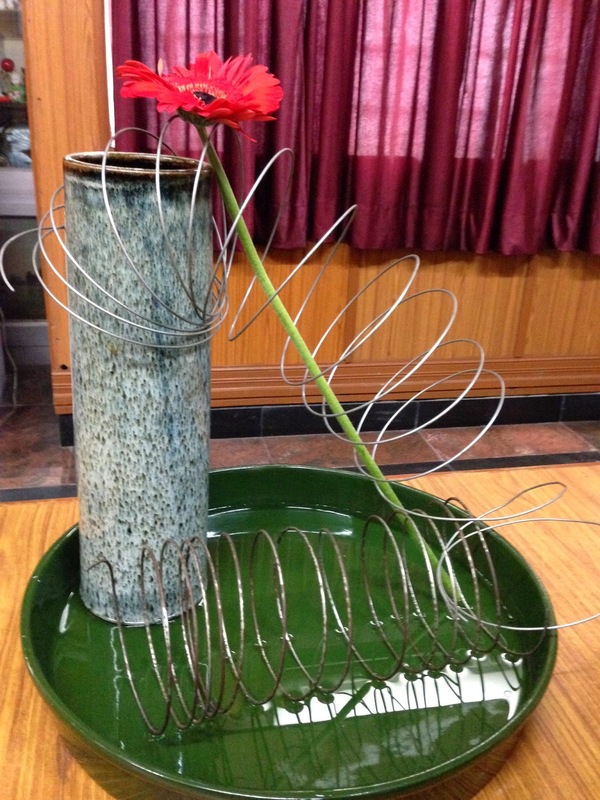 Next workshop is on Oct 15th, and the theme is working with Abstract compositions.